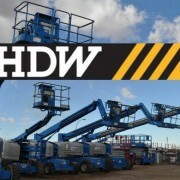 The Dutch machinery giant HDW becomes officially today in the main boom lifts supplier of Elevaciones Rama. With the signing of a new contract that overtakes, initially, the 5 million euros, it positions as the first dealer of the company in the short term. This first great contract since the incorporation of the firm to Meifus Corp is proof of the change that both the company and the sector are suffering. The gradual renovation that the machinery fleet is being subjected to contributes to the modernizing of the company image, not only because of the assets updating, but because of the quality leap done through the replacement of the old machinery in favor of one of the most globally remarkable brands, Genie Lifts. In not a so noted way, there have already been incorporated numerous truck-mounted platforms, forklift trucks, etc. that are allowing Rama to ratify its position as the leading brand in the Galician market of elevation.